The Sundown fishing crew enjoys daily trips to the beautiful blue waters of the Gulf Stream in Hatteras, North Carolina. Charter fishing on the Sundown with Capt. Terry Metts, certified U.S. Coast Guard master license. The Sundown is 47 foot, 17 foot beam with an exceptional amount of fishing area in her cockpit. She is powered with a 3406 Cat turbo diesel engine. The Sundown features the following electronics: 21 mile Raytheon radar, two GPS plotters, Furan color scope, Dytec temperature gauges, VHF radios and a single-side band radio. She has all the latest safety equipment including a Solace A self deploying life raft. Her crew is experienced, professional and courteous. She has three fighting chairs, Penn heavy duty rods and reels, a tuna stick (green stick) for exceptional tuna fishing, cabin with restroom and a 6' X 15' bimini extension from the back cabin wall for outside enjoyment and protection with a clear view of the fishing action. Seasoned anglers, families and groups welcome (maximum of 6 people). Bait, tackle and license are provided. Bring what you would like to eat and drink, we'll take care of the fishing! 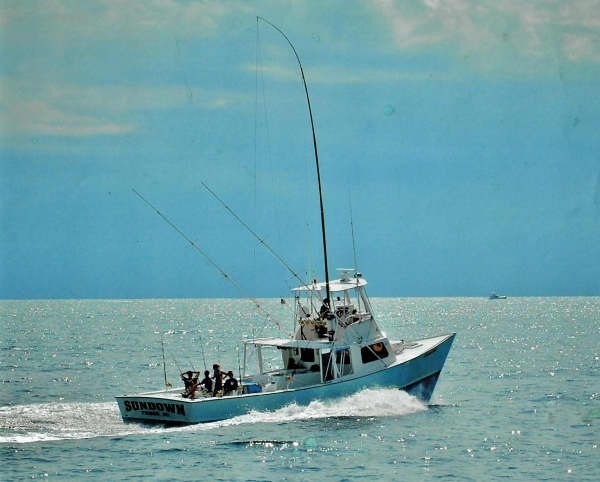 Full Day Charters are off-shore blue water fishing for you and your crew. Inshore Charters are full or 1/2 day. A great way to introduce your family and children to sports fishing.